Chateau / Country House914 sq. ft. The apartment is on the ground floor of ancient farm; it has got a large living-dining room with fully equipped kitchen with oven and microwave, fridge-freezer, 4 burner gas stove; two double bedrooms, one with a double bed and one with two single beds; bathroom with shower. It is a very typical tuscan building with cotto floor and exposed beams, all exterior is stone. The property includes a private terrace and a private garden with table, chairs and sunbeds. 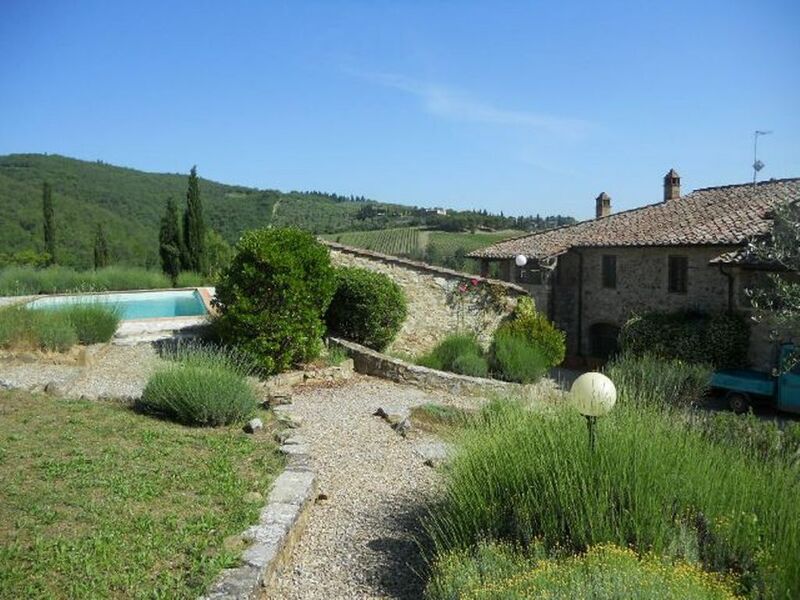 Ideally located to enjoy absolute relaxation and tranquillity a pleasant stay in the heart of Chianti, at short distance from the main tourist areas, great artistic and cultural interesting, such as Florence, Siena, San Gimignano, Monteriggioni, Volterra, Pisa, Cortona . The hamlet is located in the green hills of Tuscany and is reached along a typical country road that goes through beautiful vineyards and olive groves, about 2km from the famous Chiantigiana road (SS 222). The place is quiet and peaceful, with beautiful views of a pristine landscape. (Text automatically translated) Nearby restaurants:. Pietrafitta (road between Castellina and Panzano tel. +39 0577 741123). Vescovino The (Panzano tel. +39 055 852 464.) Being There (Panzano tel. +39 055 852 828). Osteria alla Piazza (Piazza - way between Panzano and Castellina tel. +39 0577 741042). Osteria di Passignano (Badia a Passignano - tel. +39 055 8071278) COOP Supermarket in Panzano, a small but very well equipped, located in the new part of the country, with ample parking.